Trouble viewing this email? CLICK HERE to view on the web at DrawingFree.com! On a dry sunny day you can take your drawing practice out into the light and maybe get a yummy treat too! Piggyback drawing with some of your favorite activities like sunshine, hanging out and eating! Dave, my all around tech and design guy, and I went out to a coffee place with outdoor seating and tables (alright, it WAS a Starbucks - but in a very retro building!). In the back of the patio where we landed, there were trees casting shadows on the table and thus on my drawing paper. It was a bright, cool, sunny spring like day where we could sit outside and draw and sip latte. With a friend along, you can talk and draw and eat - alone you can draw and contemplate and sip your tea. The Ah-Ha: When you get out, you leave all your distractions behind and it becomes some quality drawing practice time - the stuff that you may otherwise never find time to do! Place your paper on the ground, on a table or even taped up to a wall. Any of this will work as long as there are shadows being cast onto the surface of your paper. I've also included some transparent stuff like cellophane, a clear plastic cup and art supplies to look at too. These are all blocking light in various ways making different effects on the paper with their shadows. It is so awesome to play with making the shadows show up differently with their darker shapes and patterns on the surface of your paper by flipping and turning the objects and moving them on your paper. I'm going to use the shadows from a tree that is farther away from our table. The tree casts larger shadows with less distinct edges. The tree tall and is about four feet away from the table that my paper is on so it makes lighter and less obvious shadows. By contrast, an object that is set directly on your paper like the clear plastic cup will have crisp edges in the shadows that are right up against the cup. As the shadow moves further away from the cup the shadows edges also get less distinct as other light bounces into the shadow. The clear cup or any glass make wonderful patterns in their shadows that you can copy right on the paper. With vine charcoal OR soft drawing pencils you can make soft marks on your paper right on top of the shadows that "fall" on your paper. You get to have fun drawing on top of an image (the shadow) that is already there for you to follow. Start by lightly drawing right on top of the darker areas. You will get a truer copy of the shadow by NOT placing an outline around the edge of the shadow. This might be really hard for you to STOP yourself from doing. Practice NOT circling the shadow shapes. Work out from the center of the shadow out towards the edges of the shadow. From time to time bring your drawing OUT from "under" the shadow and take a look. The first drawing here was done in pencil. After I pulled it away from the shadow, I started doing some smearing of the graphite. I probably continued with smearing and then put it back into the shadow - possibly in a different position and drew on it again using vine charcoal. The shadows here are far from the tree that is blocking the sunlight. When light is blocked by something that is farther away from the surface of your paper, the resulting shadow has FUZZY edges that are NOT crisp. It would actually be hard, with the shadow cast from the tree, to see where the edges of these fuzzy shadows are exactly. 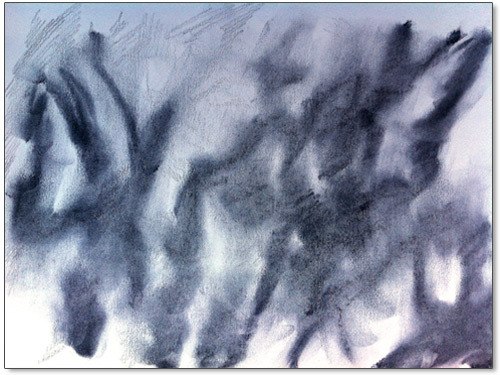 Hopefully realizing this will keep you from "clearing the matter up" by pressing a crisp, dark line into the fuzzy edged value of the tree branches on your drawing paper. Work in layers of lightly drawn value from the inside of the shadow out to the edges. 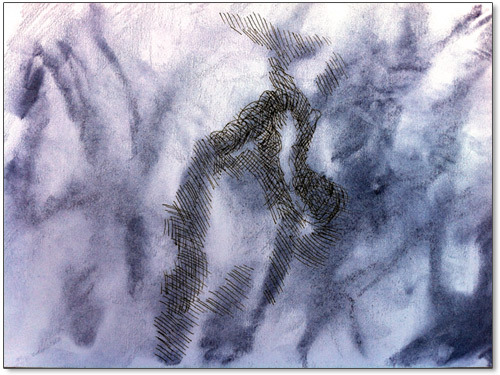 This method will give you a way to make a drawing that involves the true nature of the shadow that you are drawing on. When I got the vine charcoal drawn, I then I smeared that down too. (It doesn't have to be smeared!) You get to draw and explore and learn about applying value to your paper with different materials. Try whatever you like and whatever comes to mind! Remember that the earth moves and the shadows change more quickly than you might expect! For the last drawing step, I used a juicy ink pen (See: Ezine Seven, "Pen, Ink and Wash".) I used the pen to make the black lines. Lines that line up in as sequence of intervals with space initially in-between each line is called hatching. When the lines get crossed they are called CROSS-HATCHING. You could draw any way you want here with the pen or charcoal or pencil - or add in any other media that you like. Cross-hatching on top of you drawing might be a good way also to start to experiment with cross-hatching. 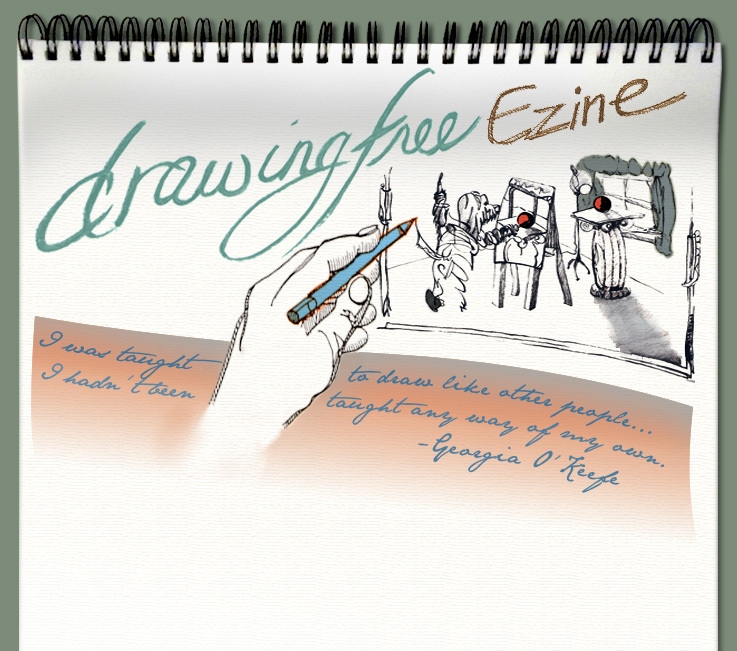 You could also go into your drawing with a "find a new format" viewfinder (See: Ezine Ten, "Draw, Cut and Place".) Have FUN! And why not some cross-hatching? Just draw over the shadows like you're sweeping with a broom or a brush across the shadow. Move from fuzzy edge to fuzzy edge and back again without lifting your pencil or charcoal. Keep your hand and pressure on the pencil or charcoal soft and light. Make lightly applied, continuous marks. Experiment to make a shadow that is drawn from a smooth group of marks. Avoid making dark zigzag lines that have a high contrast to the white paper. 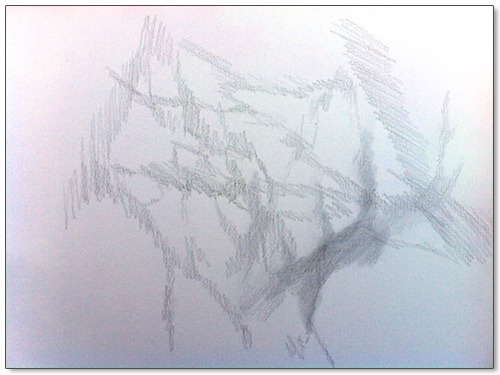 Using this shadow method allows you to practice drawing in a way that is very relaxed. You can draw without worrying about how your drawing is turning out. You are trusting in the designs of the shadows to give you your shapes and values. You can enjoy drawing with any and all inner critics turned OFF. Practice drawing without expectations!